My absence over the past few weeks can only be explained by the mental effort required to piece together a stable income while “Off the Path.” Turns out, near-total freedom can be more stressful than living and working at a predictable office job. A tourist visa allows a Gringo, such as me, to remain in Costa Rica for 90 days. Before the end of that period, Gringos must leave the country for 3 days to renew their stays and avoid fines upon exiting. This is referred to as a “border run.” Most go to Nicaragua or Panama for border runs, because they are both accessible by inexpensive, half-day bus rides. Two weeks ago, I opted for Ometepe Island (pictured), Nicaragua with a few friends. Having done little research about Ometepe, I had almost no information about where we were going. I had not been to Nicaragua; had not heard of Ometepe Island; and was ignorant of whether anyone I ever knew, other than our trip leader, had ever been there. I was in for a completely new experience. Ometepe is an undeveloped and sparsely-populated volcanic island in the middle of Lake Nicaragua. It is not completely ridiculous to suggest that Ometepe was drawn, then built by a 2nd grader. It is an island in the middle of a lake (Lake Nicaragua), which is within an isthmus (Nicaragua) and it consists of two volcanic mountains and has black-sand beaches. It is so incredibly remote and unlike any place I could have imagined. We rode a greyhound-like bus from San Jose across the Costa Rica-Nicaragua border, continued for 35 more kilometers, and then were abruptly dropped in downtown Rivas. From there, we took a cab to the dock in San Jorge where we boarded a ferry that carried us, for an hour and a half, to remote Ometepe Island. We travelled over land and water for seven hours through no places I had ever been to get to a place I never heard of and it was worth every inch (or centimeter). Once there, we were welcomed by taxicabs, rickshaw drivers and other assertive tourism service providers. The streets throughout Ometepe are clean, but are used by people in cars, on motorcycles, and on bikes and by horses, pigs and dogs—on foot. None of these animals were on leashes, but knew to get out of the way. Ometepe is the ultimate remote-outdoor vacation spot. Even with only three air conditioned hotels, it has everything travelers need for a week of adventures. Hiking the volcanoes is possible by climbers of all levels as their grades are gradual. Particularly unique and inviting is Oja de Agua (pictured). 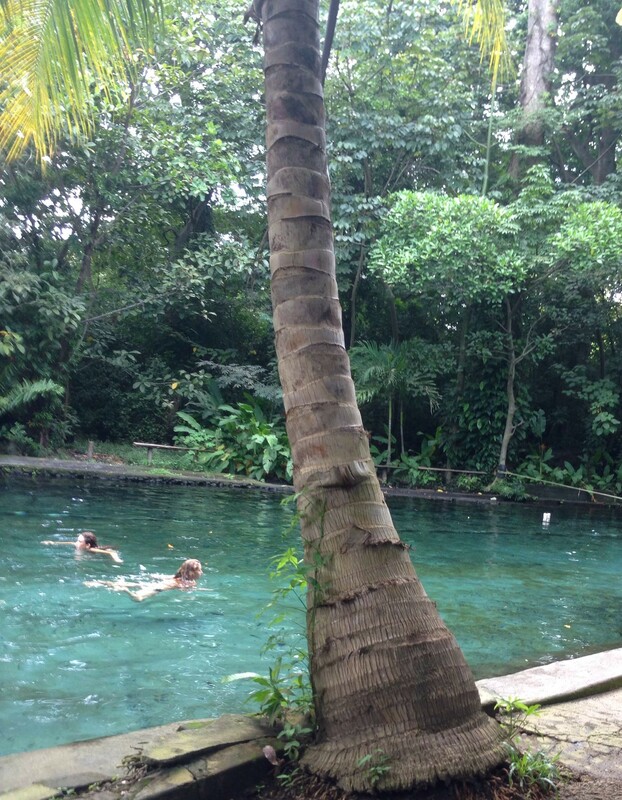 The main attraction at Oja de Agua is a giant pool dug out of the volcanic rock soil, which is filled with water from an underground river that starts at volcano Maderas. It has a rope swing and tight rope going across it. There’s even a wait staff there ready to bring you food and alcohol at Nicaraguan prices. I could go there every day for a week and consider it a complete vacation. As for food on Ometepe, the locals have figured out how to make healthy, Caribbean tasting food, which is offered for 60% of the price you might pay for similar cuisine in Costa Rica. At an unassuming looking roadside restaurant, I paid $8 for an exotic curry dish and a large smoothie. For a getaway, a non-stop adventure, or a party weekend, Ometepe is terrific. However, its appeal may soon be jeopardy. I sincerely hope Ometepe’s character remains in-tact, but am apprehensive for two reasons. First, people are finding out about it, which means it could only be a matter of time before bigger hotels and buildings are there. I am not someone who always frowns upon development, but I sincerely hope Ometepe is cared for appropriately when it happens there. Second, and most troubling, is the potential effect of the additional and superfluous (IMHO) Central American canal. A Chinese tycoon aims to build another artificial passage way through Central America, namely Nicaragua. Without knowing the costs and benefits to its developer, the environmental costs of building the impending canal could irreversibly alter Ometepe. 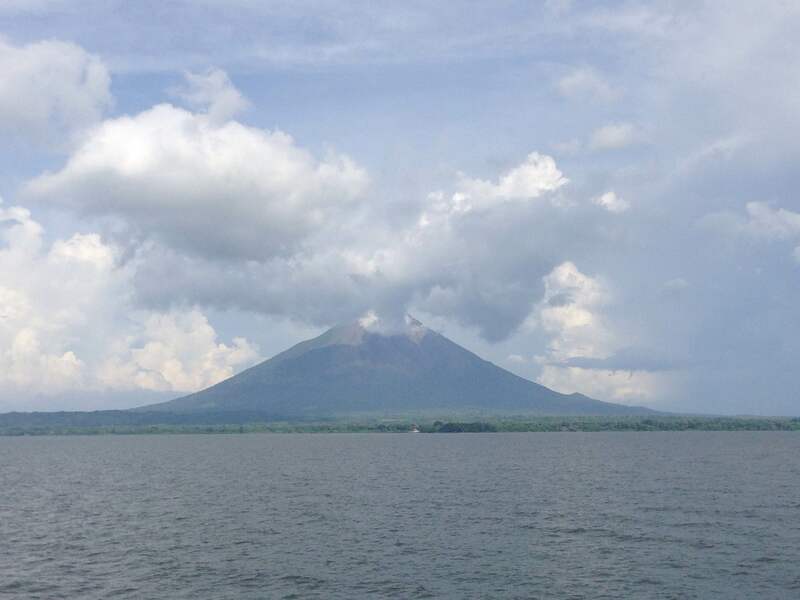 While the new canal will not traverse directly through it, building the Canal will require dredging and deepening Lake Nicaragua, which could indirectly affect the structure of Ometepe’s bordering landscape and may lead to over-development of it. The cumulative impact that the new passageway could have on surrounding areas is speculative, but we can only hope that Ometepe stays the way it is now. With the afore-mentioned in mind, the only safe play is to take a trip to Ometepe soon before it is no longer the same place I had the privilege of going last month. If there’s no Ometepe in heaven, it’s not heaven.